Haunted ruins, cursed artefacts, arcane rituals and ambulant mummies:archaeology and the ancient world have provided some of the most effective andubiquitous scenarios for tales of horror and the supernatural. Authors andfilmmakers such as MR James, Bram Stoker and Terence Fisher have drawnheavily upon popular conceptions of both the ancient past and the work of the archaeologist. This conference aims to study and celebrate this long and productive relationship. We are keen to hear from scholars and aficionados of the fictional world of uncanny archaeology including archaeologists, historians, writers and artists. The programme will include all genres where the ancient meets the ghastly including music, television, literature, film, and art. 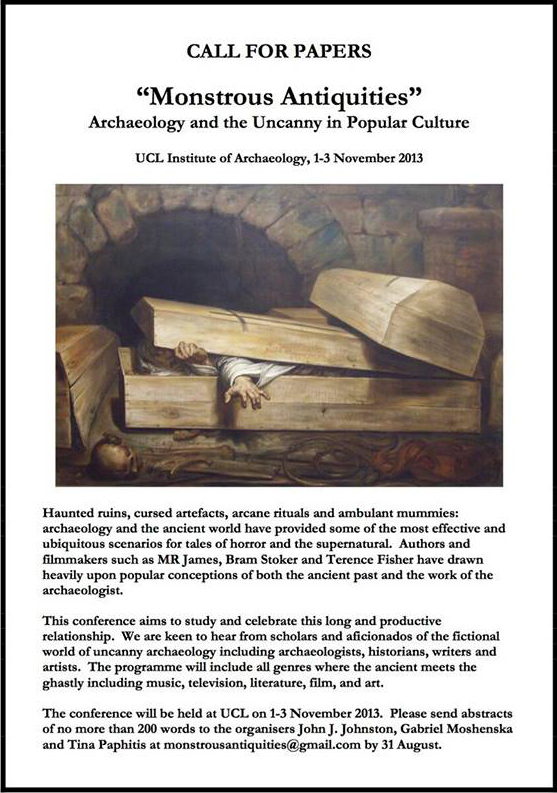 The conference will be held at UCL on 1-3 November 2013. Please send abstracts of no more than 200 words to the organisers John Johnston, Gabriel Moshenska and Tina Paphitis at monstrousantiquities [at] gmail.com by 31 August. Thanks so much to my good friend Betsy Bradley for sending this my way! Click on image to see larger, more readable version.